Here’s how to save .shsh2 blobs for Prometheus upgrade or downgrade on unsigned iOS firmware using TSS Saver. iOS developer and tinkerer tihmstar is releasing a new tool called Prometheus capable of capturing the necessary information required to downgrade or upgrade to a version of iOS which is no longer being signed by Apple. This tool is apparently set for New Year’s eve release and currently works on 64-bit devices that are already jailbroken. With an iOS 10.1.1 jailbreak by Luca Tedesco based on Google’s Project Zero exploit said to be coming soon, this is useful for those still jailbroken on iOS 9.3.3 and are not comfortable enough to jump ship on iOS 10.1.1 until a jailbreak is actually available for that firmware. By saving .shsh2 blobs for iOS 10.1.1 now, they can upgrade to iOS 10.1.1 later when the jailbreak finally drops even if by that time Apple is no longer signing the firmware. Pretty useful! The developer has already released a companion tool called tsschecker which basically lets you save .shsh2 blobs required for downgrading/upgrading purposes. Unfortunately though, the level of technical capability needed to actually use tsschecker to save the necessary .shsh2 blobs required to allow Prmoetheus to go to work maybe complex for some, that is where a new online tool aptly named TSS Saver by 1Conan comes into play. This tool basically makes the whole saving of .shsh2 blobs situation a lot more user friendly. It’s a web-based tool which simply requires the user to connect the iOS device to the computer, identify some information unique to that device, punch them into the tool, and voila! Not convinced? Allow us to walk you through the process then. Step 1: First and foremost, you’re going to need your device’s ECID number. You will need your device, a Lightning cable, and iTunes to do this. Plug your device into the machine via the USB cable and launch iTunes. Step 2: Click on the Summary tab in the left-hand pane and then locate the Serial Number on the right-hand pane. Click on the Serial Number until you see ECID. Step 3: Right-click on the ECID and copy it directly to the clipboard. Remember, if you’re using macOS Sierra, and have iOS 10, then the ECID you just copied to clipboard should be available across all devices as long as Universal Clipboard is activated. It is important to note that TSS Saver requires the ECID to be provided as hexadecimal value for it to be accepted. If you have the ECID as a decimal value, and need it to be hexadecimal, then you can convert it using any of the many online conversion tools available on web. Step 4: In addition to the ECID, you’re also going to need your device’s identifier, which you can find using same process as above by clicking on Serial Number until it shows Model Identifier. Step 5: Once you have both ECID in hexadecimal and Model Identifier, head over to the following URL to access TSS Saver: tsssaver.1conan.com. Step 6: Where it asks for it, paste in the hexadecimal ECID that you managed to extract earlier. Step 7: Next, make sure that you select your correct device type and model number as found earlier under the Identifier: section. 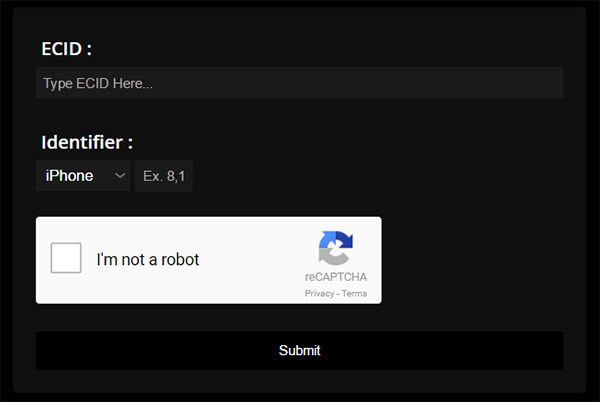 Step 8: With all the required information entered, make sure you tick the “I’m not a robot” check before proceeding. Step 9: Finally, hit the Submit button, and hopefully the online tool should do all of the heavy lifting for you and shoot off to capture and save the .shsh2 blobs on your behalf for all firmware versions that are currently being signed by Apple. It will then take you directly to a results page which will give you access to the saved blobs for downloading. In case you ever lose your link or downloaded blobs, you can download them once again by visiting the following URL: tsssaver.1conan.com/shsh/”decimal ECID”, where you need to replace “decimal ECID” with the hexadecimal ECID you extracted earlier. Alternatively, you can simply head over to the tool’s website and enter the hexadecimal ECID in the Lost your link? section and hit the Get your blobs button to grab the .shsh2 blobs. Easy, wasn’t it? Now we wait for tihmstar to release Prometheus tool! I have Iphone 6s with IOS 9.3.3 Jailbroken. I want to go to IOS 10.1.1 since it can now be jailbroken. Is this possible for me to do? I got the blobs but it had a folder for 10.2. Help.. I keep getting a invalid ecid. Any recommendations? I keep getting a invalid ECID. Any idea what the issue is . I tried it as hex and as decimal just to be sure.. So no one is concerned about uploading to a central database your Iphone info? Got the same question, but no one seems to answer it… Don’t really want to go through all of this when I already have a working JB. Wish someone would answer…GRRRR!! No you cannot. you can only downgrade from let’s say 9.X to 9.X so for example you could have downgraded from 9.3.5 to 9.3.3 if you had the blobs. Or even 10.2 to 10.1.1 again if you got the blobs. There is no way to downgrade from 10.X to 9.X so it’s not worth giving up your 9.3.3 jailbreak for it. How did you convert it to hexadecimal??? I can’t find a converter! How do you convert the ECID number from decimal to hexadecimal???? The guy in the article thinks we can get a converter on the web easily but there nothing about it on the web and the one you find it is for shorter numbers. You shouldn’t need to convert it. You are right. I don’t know why they complicated the article. And BTW, How do you get your internal name/model / Board configuration for your iphone? How do you get your internal name/model / Board configuration for your iphone? Yeah, i found this article confusing as well. I followed 1Conan’s tutorial on reddit. So if itunes tells you that your ECID is: 181858300BEC26, then it is giving it in hexadecimal system, right? I don’t know why the writer of this article says that itunes gives the number is decimal system. Well, I may be foolish, but I updated to 10.2 this morning in hopes of a stable JB being released soon. To be safe, I just saved the Blobs now and still have the 9.3.3 file from a week ago. Who knows, maybe something can be done with it. I can live without JB for now. I only used it for faster animations and an occasional tether to my laptop. I just wish Apple would stop being assholes about this. If they don’t want people JBing, them ease up on the customization restrictions. Thanks for the reply Gazra. Thia maybe a dumb question but do i do this on my phone or pc? Have you gone to website as posted above? A bit silly, but not dumb. You can do this from either device. Thanks for the advice. Much appreciated. I’ll stick with my current JB for now. Cheers mate! Since there was a blob snafu, is there any way to overwrite the BAD blobs with good ones? I tried for 10.2 (still being signed I thought), and it left 4 invalid ones, and only replaced the 5th. To get the proper model number, you need to get an app from the App Store called “CPU Identifier”. Thankfully, it’s free. Enter the Model Device the app reports into that Model field on the website and it will work. I had a pickle of a time figuring this out. i had a hard time figuring that out too. Thanks for your instruction, that worked. there’s no option to choose my model indentifier? what do i do? I was always getting an error until i tried internet explorer. how do i find the internal name/model or board config? Device Model will be there.